The Beijing central business district is located a few km northeast of the Forbidden City and extends in Wangjing towards the airport. 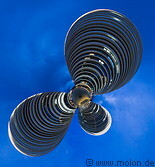 A number of finance, media, and business services companies are located here. 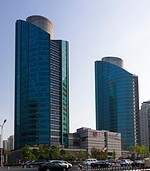 The area consists of large modern buildings and many skyscrapers. The China World Trade Centre Tower III is a 330m tall skyscraper in Guomao, built between 2005 and 2010. 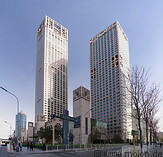 The Sanlitun and Wangjing SOHO are residential, commercial and office complexes in the Sanlitun and Chaoyang areas, developed by SOHO China, a Chinese prime office real-estate developer.